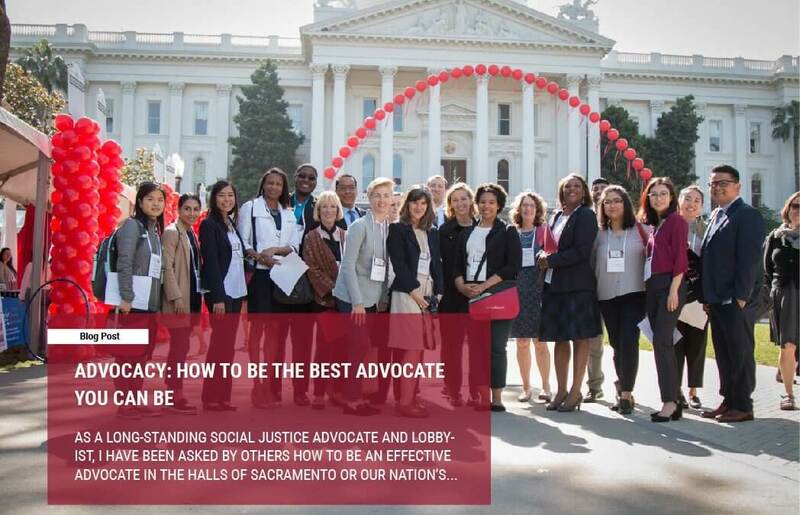 As a long-standing social justice advocate and lobbyist, I have been asked by others how to be an effective advocate in the halls of Sacramento or our nation’s capital. I was recently reflecting on this upon my return from Washington, D.C., where thousands of community health center advocates descended on the Hill to advocate on issues important to community health centers and the patients we serve – including the reauthorization of our federal funding for the next five years. Community health centers have a very successful track record of securing bipartisan support both in Sacramento and Washington, D.C. The importance of our advocacy and our successful track record got me thinking about what makes our organization and our members’ such successful advocates for the health center movement. I’ve outlined five fundamental things I think are important in being the best advocate you can be and I will tell you how they relate to my own experiences. One of the soundest pieces of advice I’ve ever gotten, and continue to pass on to others, is to come prepared with knowledge in a given area and have the research and/or data to back it up. If you have the information and the proof to back it up, you are that much more credible and become a valuable resource for people in the future. Whether you are meeting with a city council member or a member of Congress, the same rules apply – know your stuff! While community health centers are burdened with significant data requirements from federal and state government and health care payors, one of the great advantages it affords us is that we can tell our story – including how many patients we serve, their income, ethnicity, insurance status, and languages spoken, among other important data points. This is powerful data that helps us build our case with elected officials. I’ve said it before, and I’ll say it again, there is nothing more powerful than having a large number of people united in their advocacy on the same issue at the same time. Even though coordinating a trip out to D.C. or a lobby day in Sacramento is challenging and cumbersome, showing up and making your voice heard en masse, is a great way to have an impact. California health centers continue to show up in great numbers to D.C. for national advocacy efforts led by the National Association of Community Health Centers. Year after year, California has the largest delegation. We show up because it’s important and we know that size does matter when you are wanting to get your issues to the forefront with decision makers. There truly is great strength in numbers when it comes to advocacy. Building on your strength in numbers is ensuring coordination between everyone involved. Here in California, that means working with both our regional consortia and individual members, as well as our national association to make the splash that we want when we show up in D.C. and Sacramento. Managing our meetings, coordinating handouts, ensuring we know who will be talking about what, and building off of trusted relationships in a coordinated way are all important components of successful advocacy. If you go into a meeting with ten people, there should be a plan in place so that everyone understands the goal of the meeting, who will take the lead, who will present on issues, and so forth. Also, if it is a large group, the data used should be consistent and the “asks” should be consistent (although both may vary depending on which side of the aisle you are engaging with). Coordination is key. While the sheer number of people advocating with you is important, having the right people is also significant to your efforts. When advocating for health centers, we often ensure we have providers and consumer board members (patients) there to tell their stories first hand – in addition to health center leaders and staff. Hearing from those on the front lines and hearing from patients that directly feel the impact of policy decisions is very powerful. Never underestimate the effectiveness of who you involve in your cause. One thing I have come to realize is that for our cause, doctors and patients are some of the most effective spokespersons in front of policy makers. Who is the most effective spokesperson for your cause? Make sure they are front and center. If there’s one thing I’ve learned in nearly three decades of doing this work is the importance of building and fostering a diverse set of relationships along the way. Join coalitions, network with like-minded individuals, go out and march and rally with others to build a successful network of advocates that can help you in your efforts as well. Also, step outside your comfort zone of like-minded individuals and reach out to beyond your base to build broader alliances and seek wider support. We are so fortunate to have built such strong ties to both our national organization – the National Association of Community Health Centers- as well as our Regional Associations of California (RAC) which join us in fighting at the local, state and federal levels. Going outside of the health center world and partnering with other allies in health care and beyond is equally important. The broader the coalition that supports your issue, the more likely it is that your issues will be paid attention to by policy makers. For community health centers, having relationships on both sides of the aisle has been key to the success of our advocacy and it has required fostering and developing relationships among a diverse group. At the end of the day, all of these factors play an important role in successful advocacy. At CPCA, we are fortunate to have dedicated staff and resources to facilitate our advocacy efforts. But I have certainly been involved with smaller advocacy groups that have less staff or are volunteer-based. These organizations are able to put together successful advocacy programs as well. Whether you are a single person, a group of volunteers, or a large organization – I hope you find these tips helpful in becoming the best advocate you can be for your cause. And above all else, being passionate about the issues you are advocating for is probably one of the most significant pieces of this work. Not only will your passion shine through when you speak about these issues, it will also keep you going when you get knocked down –which trust me, will happen from time to time. As long as you believe in what you are doing, are passionate in your convictions, and stay in it for the long haul, you can go far.